One of the most commonly asked question is “why is your equipment covered in pink tape?” (about a year ago I was asked “why is your gear gear covered in purple & orange tape,” I changed tape colours this year to simplify things). The answer to “Why is your equipment covered in pink tape?” is easy. I started the practice of placing bright colourful tape on my equipment when I covered hard news, politics and a lot of sports. Every photographer’s equipment looked essentially the same when placed down. By putting very bright tape on my cameras, lenses, monopods, etc, I could easily identify which gear was mine in the media room or on the sidelines. Many photographers use blue, red, yellow and green, so I avoided these colours and went for incredibly bright coloured tape. As my work shifted away from news, sports and politics I continued to tape my equipment out of habit. I found having my bags taped made picking them out at the baggage carousel easy following a flight. Bright tape on a bag also made it easy to find my bag on a dark overnight flight when looking in the overhead storage bins. With the progression of my work towards environmental portraits and corporate work I found the tape had another extremely valuable use. This new use? Never leaving my gear behind! Over the past few years I have taped every piece of equipment (except my Canon 70-200f2.8L for some unexplainable reason, it’s just wrapped in black gaffers tape). From PC cords to lens caps, camera batteries to camera bodies, everything has tape on it. When I tear down after a shoot I can quickly scan the room and look for the hot pink tape. When I pack up and leave a hotel room, I always scan for bright pink tape. When I am unpacking my bags it is hard to not notice the bright tape inside the solid coloured fabric of a camera bag. 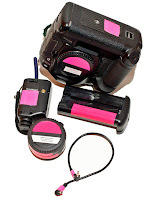 In addition to the pink tape, all of my photo gear (within reason) also has a white label on it. This white label is printed with my name and contact information. Should I leave something behind, and it is not likely, it increases my chances of someone looking at the label of giving me a call to tell me that have my gear. So for those of you who have e-mailed me to ask “Why is your equipment covered in pink tape?” hopefully this answered your question. Where do you find your hot pink tape? The hot pink duct tape (and feel free to find your own fun colour, my daughter chose pink for me, she was tired of the orange/purple she has chosen for me when she was around 3) can be found at Home Depot, Lowes, even WalMart (not that I advocate shopping at WalMart).